Mountain biking, Rim Creek Trail, Snowmass Village (Aspen), Colorado USA. Want to tell us about your favorite trails? We’re ready to listen. Visit tinyurl.com/pitrailtalk. We’ve got a simple question-and-answer form that will help you brag on your favorite place! The number and diversity of mountain bike trails in the Roaring Fork Valley has exploded over the last decade — thanks in large part to riders finally forming a sort of political peloton. New trails from Aspen to Glenwood Springs are thanks in large part to lobbying, fundraising and pick-and-shovel work by the Roaring Fork Mountain Bike Association, formed in 2008. The biggest change in the valley’s trail network is routes have been built throughout the valley. They are within riding distance of Basalt, El Jebel, Carbondale and Glenwood Springs, as well as Aspen and Snowmass Village. 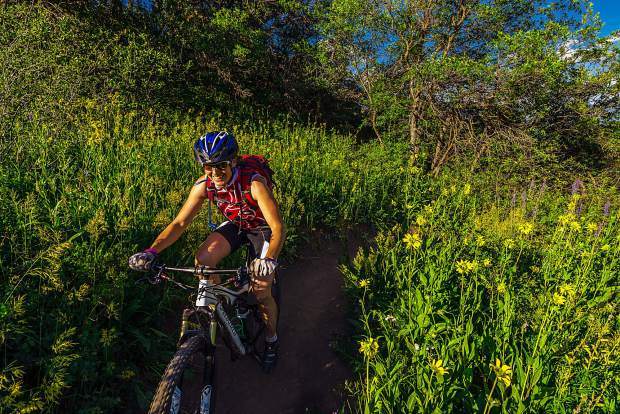 The mountain bike association and city of Glenwood Springs are teaming to add 8 miles of trails in South Canyon, just west of town via Interstate 70. The city is providing the land; RFMBA is providing its expertise and fundraising assistance to get the trails started this summer. About $250,000 was raised from Garfield County, Colorado Parks and Wildlife through the state trails grant program, Alpine Bank, town of New Castle, as well as Glenwood Springs and RFMBA’s members.